Or to use another cliche, what if they gave a party and nobody came? 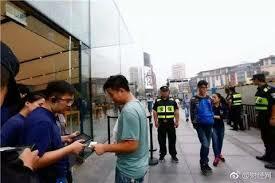 Many of the earliest buyers of the iPhone in stores in the US and elsewhere have been Chinese people looking to resell the phones in China for a steep markup. Since 2010, Apple has been selling the iPhone in China directly and this year, China is among the first markets to get the latest phone. But it is still far cheaper, for example, for Chinese people to cross over into Hong Kong and buy it there. Based on the retail prices listed on Apple’s various global sites, we looked at the cost* of the 64GB iPhone 8 in the countries where the iPhone 8 will be available for purchase this month and ranked them in terms of their dollar, yuan, and pound equivalents. When Apple announced the ultra-premium iPhone X at its big event earlier this month, consumers balked at the $1,000 price tag. The iPhone 8 and 8 Plus offer users looking to upgrade their phones a cheaper option; the iPhone 8 starts at $699 and the larger iPhone 8 Plus starts at $799 for the 64GB models in the US. But if you live outside the US, you will likely end up paying a lot more than that. The iPhone 8 base model costs close to the equivalent of $1,000 in many countries, the same cost of the bigger, better iPhone X in the US. For years, many of the earliest buyers of the iPhone in stores in the US (paywall) and elsewhere have been Chinese people looking to resell the phones in China for a steep markup. Since 2010, Apple has been selling the iPhone in China directly and this year, China is among the first markets to get the latest phone. But it is still far cheaper, for example, for Chinese people to cross over into Hong Kong and buy it there. In the aftermath of Brexit, the pound lost almost a fifth of its value and settled into a slump against the dollar, meaning most things became a lot more expensive for Brits. Despite that, there are still many places where the iPhone is more expensive in sterling terms than back home—including the US, where it is a whopping £181 cheaper. So, the most expensive place to buy an iPhone 8 is Hungary, where the basic model costs the forint equivalent of $1,020.61, 6,689.31 yuan, and £754.57. The cheapest iPhone outside the US is in Japan, where the iPhone 8 starts at the Japanese yen equivalent of $707.94, 4,606.47 yuan, and £519.28. There is a price disparity between countries, but that can be slightly misleading—the US prices on the Apple website don’t include taxes, so most Americans will end up paying more than the $699 list price. (I.e. iPhone users in Alabama will pay close to 10% sales tax, but residents of New Hampshire won’t pay any tax at all. ) When we tried to order an iPhone 8 to the Quartz office in New York, the basic 64GB model cost $761.04 with estimated taxes. In countries where the sales tax is the same in all areas Apple’s prices typically include tax in the total amount. So an iPhone 8 in Hungary, which has the highest retail price in dollars, yuan, and pounds of the countries where it’s available for purchase, in reality is a better deal than it appears because the price includes VAT. When is the iPhone 8 on sale? According to Apple, the iPhone 8 goes on sale on Sept. 22 in Australia, Austria, Belgium, Canada, China, Denmark, Finland, France, Germany, Hong Kong, Ireland, Italy, Japan, Luxembourg, Mexico, Netherlands, New Zealand, Norway, Portugal, Puerto Rico, Singapore, Spain, Sweden, Switzerland, Taiwan, UAE, the UK, the US and US Virgin Islands. It will then be available in Andorra, Bahrain, Bulgaria, Croatia, Cyprus, Czech Republic, Estonia, Greece, Greenland, Guernsey, Hungary, Iceland, India, Isle of Man, Israel, Jersey, Kuwait, Latvia, Liechtenstein, Lithuania, Malta, Monaco, Poland, Qatar, Romania, Russia, Saudi Arabia, Slovakia and Slovenia on Sept. 29.